You are currently on: Creative Practice: Popular Music page. Open sub navigation overlay. The Creative Practice: Popular Music specialisation helps to expand your songwriting, performance and production skills. It provides a sound understanding of ways to effectively engage with the popular music industry. You will have opportunities to interact with a network of fellow student songwriters and performers, as well as collaborate with talented instrumentalists studying in the jazz specialisation. You will meet and work with many of your future professional musical partners, band members and studio engineers. During your studies you will compose, record and perform as a solo artist, lead your own bands and ensembles while supporting your fellow students’ musical projects. You will perform regularly at concerts held at the historic Kenneth Myers Centre, formerly Auckland’s principal radio and television studios, and at other public popular music venues in the city. We understand that decisions about where to study music are often based upon availability of specific teachers. You are invited to contact staff directly with any queries you may have. See our popular music teacher biographies. 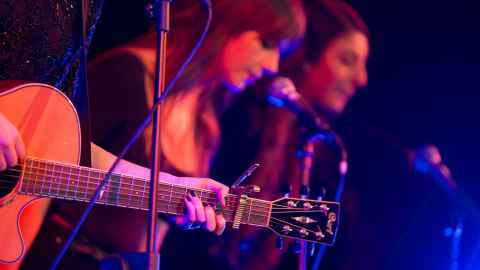 Where can the Creative Practice: Popular Music specialisation take you? Most of our students aspire to become performers. Many supplement their gigs through teaching, arts administration roles, producing, music journalism or event management.